In the past few years, many top skincare companies have started to introduce superfoods into their products. Two of the reasons for doing so is the high concentration of antioxidants and anti-inflammatories found in superfoods that heal your body from the inside and quite possibly your skin from the outside. It is becoming more commonplace to use food as a way to keep you healthy and looking younger, so it seems like a natural progression to incorporate them into one’s skincare routine… or so skincare companies will have you believe. At the moment, it does not appear this skincare trend is going anywhere, however time will tell. Acai Berries – These superfood berries used in topical products are believed to prevent the signs of aging, hydrate the skin, keep skin firm and elastic, and prevent free radical cells. Argan Oil – Argan oil in its pure state is known to reduce inflammation and greatly moisturize the skin. Beware of mass produced argan oil with additives. Avocado Oil – Avocado has long been a superfood, and its oil is used to keep skin elastic and smooth resulting in a more youthful appearance. It also acts as a moisturizer and protects the skin from UV rays. Green Tea – Green tea has long been used to fight aging from the inside. Now, more and more people are using it externally, as well. Such topical benefits include easing rosacea symptoms, fighting free radical cells, skin cell rejuvenation, minimizing acne, and reducing UV damage. Kale – It is believed that when kale is used topically that it will reduce dark circles, promote the production of collagen, increase cell rejuvenation, tighten pores, and prevent free radical cells. Matcha – This powder is basically ground up green tea leaves, more or less. It is believed that the healing properties and benefits of matcha are even greater than that of green tea due to its significantly higher concentration of antioxidants. When used in skincare, it is said to minimize redness from rosacea, prevent free radical cells, and reduce the signs of aging. 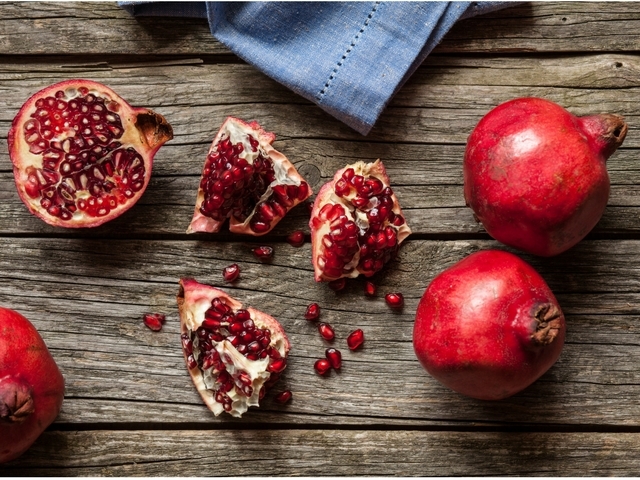 Pomegranate Seed Oil – This super fruit has been around for awhile now, however it is only recently becoming more popular in skincare products as a concentrated oil. It is believed that it can prevent acne, hydrate skin, minimize the appearance of aging, reduce the breakdown of collagen, and repair DNA damage. Quinoa Extract – This extract is said to generate surface cell rejuvenation to provide you with a more youthful appearance through moisturizing and protecting against free radical cells. Turmeric – This internal miracle root is thought to assist with minimizing acne scarring, healing wounds, controlling flare-ups with psoriasis, and providing an overall glow to your skin. It should be noted that little scientific research has been verified on the results of most superfoods in skincare products. Such superfoods are presumed to be highly beneficial as a topical active ingredient given their inherent internal benefits, however very few in-depth studies have been conducted. From a marketing perspective, it sure sounds good though, right?! Thanks for including some of the products that use super foods. These are all foods that I eat to maintain good health so I am sure these products will be powerful in maintaining beautiful skin.